Studio-style compression, with uncoloured tonality, in a pedal. Lots of control for fine tuning. LED meter lets you see what's happening. Mix control prevents squashed tones. Control legends hard to see. Pricey! 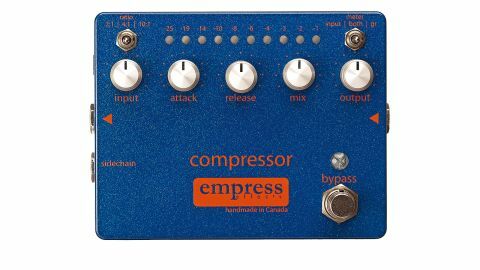 Founded by designer Steve Bragg, Canada-based Empress Effects offers a broad and increasing range of stompboxes with more than a different slant or two. The Compressor, for example, is not your usual plug-in and squash variety. "An excellent addition to your pedalboard if standard compressors don't cut it for you"
It offers 2:1, 4:1 and 10:1 switchable ratios, input, attack, release, mix and output chassis- mounted rotary controls, a 10-LED meter (switchable to display gain reduction, input volume or both) and true bypass switching with jack input and output. On top of all that, there's a side-chain TRS loop input for a filtered signal so the compression works only on part of the input - for example, the lower frequencies of a bass guitar. Unless you're familiar with studio-style compressors, a read of the manual is essential. What you have is very precise control. Firstly, the LED meter let's you see what's happening - handy if you're lightly compressing or limiting peaks on a percussive acoustic guitar. Secondly, that mix control means you can blend some of the original signal with the compressed signal to avoid things sounding over-squashed. An excellent addition to your pedalboard if standard compressors don't cut it for you. It's a shame the control legends are so hard to see in all but the brightest lighting.